Today's card uses a stamp from the new Scattered Leaves Digikit. Love this stamp... here I've turned it upside down and tried to make it into mistletoe... does it work? Could you tell what it was?? The sentiment is half typed and half from the Words of Love Digikit and that sweet snowflake paper is from Echo Park's All I Want for Christmas Digikit. Hope you are having a good day. I just ordered a LOAD of new products for my weekend. Yay! It totally works as mistletoe -- In fact my first, confused thought was "the mistletoe is called Scattered Leaves ??" Stunning, Lucy - just perfect! It's gorgeous, so looks like mistletoe. 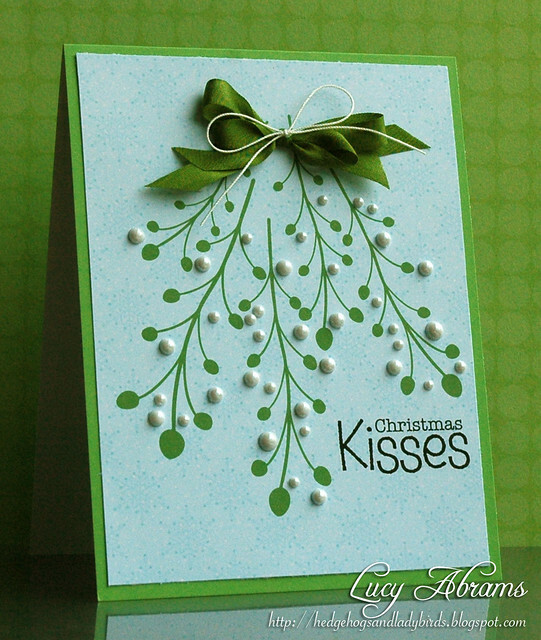 I just love this card and yes, it does look like mistletoe! It is so much fun to use stamps in different ways and this one is wonderful! It works perfectly & it's gorgeous! so sweet! I love it!! OH.....So Pretty and Perfect!!! Gorgeous Gorgeous Card Lucy!!!! yes it works and its fabulous! Hi Lucy, I just love this look - it is the happiest card I've ever seen. Fabulous design and yet it definitely looks like mistletoe. Love, love, LOVE this, Lucy! Must remember this idea - the pearls are the perfect embellishment! Beautiful card and it really does look like mistletoe. Great idea!!! Yummy card, love all the sweet blues and greens together! It definitely looks like a mistletoe! So beautiful Lucy ! Love the way the pearls have been arranged ! so pretty. Love the aqua and green together. Gorgeous card. So creative. You are inspiring me to try digital card making. Thanks for sharing. Beautiful card! I'm your new follower! Delightful card, Lucy! Definitely works as mistletoe. love the bow and the simplicity. Gorgeous!